The 2010 November Nine have been chosen. 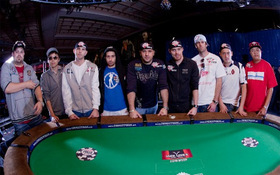 This year’s table has quite a large range of skill sets from complete newbie’s to day in day out poker professionals. Only one can walk away and make poker history by becoming the 2010 World Series of Poker Main Event champion as well as receiving just over 8 million dollars. Jonathan Duhamel – Jonathan is sitting as the commanding chip leader with over 65 million chips in front of him. He has played a few big tournaments before this so you can expect him to play a solid game. Though Duhamel is not the most skilled player on paper, his massive chip lead definitely fingers him as one of the favourites. John Dolan – Sitting second in chips with around 45 million in front of him. He has played for big money before. He has a decent amount of experience in tournament poker and definitely hasn’t made the final table of the main event solely on luck. Joseph Cheong – Joseph is third in chips with 23 million to play with. He is a rookie to high stakes tournaments however he has played a few lower buy-in events before. Though no one is expecting Joseph to win, he still does a chance with that healthy chip stack. John Racener – John is one of the more experienced players sitting in the November Nine. He is sitting 4th in chips and is used to playing for high amount of money online and offline. Some people would consider him the favourite with a very nice chip stack of over 19 million chips he has room to play. John is definitely a player you should be looking out for to clinch the title. Matthew Jarvis – Matthew is sitting in 5th place with over 16 millions in his stack. He is a relatively unknown player who has had a little success online. He is not considered one of the most skilled players on the table but he has played a solid game so far and definitely understands the strategy behind poker. Fillipo Candio – Filippo is sitting in 6th place with 16.4 million in chips. He is quite an unknown player who has had some success online and in Italy. No one really knows the style of his game and is marked as one of the dark horses of the tournaments. If anyone could cause an upset at the final table it will be Fillipo. Michael Mizrachi – Mizrachi has just over 14 million chips to his name. He is considered by many the most skilled player at the table. He still has a little room to play with his chip stack at the moment and is no stranger to winning large sums of money at tournaments. Mizrachi is a player you should definitely look out for as he plays a very solid game and is a truly successful professional poker player. Soi Nguyen : Soi is one of the Cinderella stories of the November Nine and is sitting in 8th place with just under 10 million chips. This only Soi’s 4th live tournament he has ever played which means he might be fazed by all the attention. This incredible run is an inspiration to many new players and though he is not the favourite to win by quite a long shot it is nice to have a complete amateur in the final nine. Jason Senti – Senti is sitting on just over 7 million chips and is in last place going into the final table. He is a full time poker professional who teaches at bluefirepoker.com. Though senti is no stranger to high stakes play he is going to have to chip up pretty quickly when play resumes in order to show his true playing style. If Senti manages to double up early on he will have a decent shot of winning the 8 million dollar first prize. This entry was posted on Thursday, July 29th, 2010 at 4:54 am and is filed under Poker News. You can follow any responses to this entry through the RSS 2.0 feed. You can leave a response, or trackback from your own site.